The Science which deals with the principles and practices of the ways of healthy and happy living is known as Ayurveda. It is believed that the corporeal human body is a medium in materializing the Dharma (Human duties) Arth, (meaningful activities) Kay (worldly desire) and. therefore; it is the duty of every individual to preserve it by best possible means. But at the same time one must keep in mind that the ultimate goal of human life is to achieve Moksha i.e. Salvation unto the supreme soul. And for this reason only we are supposed to indulge in everything good, on human ground from childhood. If a person is inclined towards understanding and realizes the nature of the soul, he will be able to face the burden of old age and sickness without distress and will achieve the ultimate goal, the supreme happiness at the end. According to Indian philosophy the treatises that encompass the whole knowledge of Universe are Vedas. They are four in number, viz. Rigveda, Yajurveda, Samveda and Atharveda. Among these, since the Atharveda mainly deals with different facets of health welfare it is considered to be the predecessor of Ayurveda. The term Ayurveda is connected to this system because it gives the knowledge of the whole of the Ayu (the life) to say, in brief, this term heralds each and every facet of life from birth to death or in other words the creation, sustenance and destruction phenomena are elaborately explained and this was the reason for which affix Veda is added to Ayurveda only, even though a good number of other sciences too did exist in ancient India. The creation and destruction of the world have of course been deduced in many ways, but the living creatures, particularly the human beings have its own importance, because the human body is a supreme boon of nature, and in itself bears all the characteristics of its originator. Prakriti and Purusha are claimed to be the root factors behind the creation of the world. But neither the Prakriti nor the Purusha alone can form anything. Prakriti, Purusha are said to give rise to Mahattatwa, Mahattatwa to Ahankar, Ahankarto Man, and thereafter five Tanmatra, five Mahabhootas five Gyanendriyas and five Karmendriyas are said to evoke. But even after being a conglomeration of all these components the true existence in life comes only when the Jivatma (Purusha) is joined. According to Ayurveda this Universe is created from the five elements, Prithvi (Earth), Jala (Water), Agni (Fire), Vayu (Air) and Akasha (Space) and these constitute our body also. These five elements constitute the body in various distinct and indistinct forms, viz. Doshas (Metabolic Components), Dhatus (Vital Components) and Malas (Eliminable end products). The Doshas are three in number, i.e. 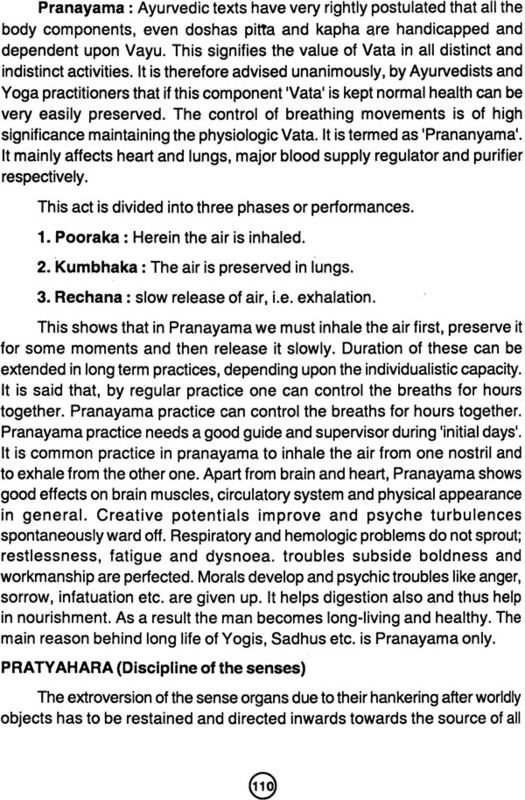 Vata (Air), Pitta (Bile) and Kapha (Phlegm). It is added that Vata is principally composed of Air and (Space) Pitta is of fire and Kapha is the product of water and earth. Similarly the vital components and by products are also of elemental origin and thus the study of these things only makes the foundation of Ayurveda. Any deficiency, excess or vitiation, either in Doshas or in Dhatus may induce a disease in Ayurveda. Theories always aim at keeping a physiologic equilibrium in the level of these things and this is served by means of diet, deed and medicines. There are six tastes in edible and therapeutic recipes which balance the deficiencies or excesses of the vital components. These tastes are sweet, sour, salty, bitter, astringent and pungent. There are 20 qualities i.e. heavy-light, dull-fickle, cold-hot, sticky- rough, hard-soft, thin-thick etc. Presence of these qualities suitable to the elements are found in all substances. Cold and hot are two states of all these substances. All tastes are transformed into sweet, acidic and pungent after digestion. This is called Vipaka. All substances have either a good or a bad effect on the body. It is the fundamental principle of Ayurvedic treatment that excess or deficiencies of any of the substances are compensated by the use of suitable diet, deed and medicine. The formulations in Ayurveda are herbal, mineral or animal in origin, or their permutations and combinations. Ayurvedic medicines balance the Tridoshas and Saptadhatus In our body. These balance the digestive power and normalize the function of all organs. Therefore as a result of this the mind and soul becomes happy and healthy. Such a person is called a healthy person. Almost all the sciences and philosophies of the world deal with one or the other aspect of human life, except Ayurveda, the Indian science of life which treats the philosophy of mankind, as a whole, logically, scientifically and succinctly. So does the Shrimad Bhagwad Geeta treatise. Whether it is Geeta or Ayurveda, Mana (Mind) is said to be the most active sense organ because this only makes other sensory and motor organs to function. But at the same time it is very wavering in nature and is therefore, the root cause behind all the sorrows and disappointments, indulgence and emancipation. For this reason only both the Shastras are directed to tame it, so as to vow all disappointments and frustration. The faculties of thinking, rationalizing, logic, meditation and determination are naturally endowed by Mana. This also makes access into Indriyas to get them involved in their respective functioning’s or brings them out in adversities. This is also the basis of introspection capacity in individuals. Individual perfect ness can be achieved by following the rules and regulations of proper diet, sleep and Brahmacharya and good conduct and behavior in life. In this manner a person can attain a perfect life full of health and happiness, unanimously it has been accepted by both the Shastras that the cause behind life in any one is Atma (soul), which is a part of God, the Almighty. Now we can easily consider that the Life is by and for Lord the supreme. A general consensus made in Ayurveda, and in Geeta too is that when we are so closely related to God our lives are not just for the sake of selfish motives, not even for solving individual’s problems, but is meant to love and benefit one and all. In Ayurveda it is stated The object of Ayurveda and Geeta is universal. Lord Brahma has a capacity to incarnate himself into many forms at the time of the beginning of every era known as Yuga. Lord Krishna in Geeta too has version of this supreme theory. The Origin of Ayurveda as well as Bhagwad Geeta is from the angle of Indian philosophies, both believe that the formation of Universe has been from the almighty supernatural power of Lord Brahma, the creator of this Universe. Both promulgate that every existence in the world whether animate or inanimate comprises of material and non-material elements. And according to both all the material substances that are produced by the permutation and combinations of different basic materials ultimately disintegrate and are reduced to the subtle indistinct elements. So, the processes of creations, destruction and recreation are the eternal laws of this Universe. Therefore from birth to death, there are many challenges physical, organic, mental in human life. Ayurved solves all these problems by preventive and curative measures. Geeta also gives us the same direction for physical and mental fitness and leading a healthy and happy life being a yogi purush. In this context I have brought forth a comparative account of some thoughts of Ayurved & Bhagvad Geeta in this book. I know very well that Geeta is a God given path of knowledge and I am not a person to say anything in this holy and philosophical granth, but it is justapettyeffOrtOflmyparttOWardSaneWc0flcePt0fth0ughtmb0d in Bhagwad Geeta and Ayurveda. I have mainly focused on the similarity of the thoughts in Geeta and Ayueda right from evolution of the universe up to the path of salvation. Lastly I wish to say that there may be many mistakes in this work old mine but I humbly plead my readers to accept the real essence of motive behind this effort. 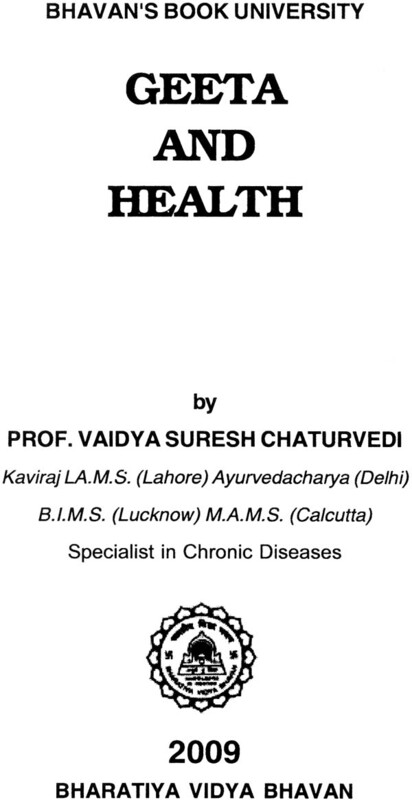 “Geeta and Health” has been authored by the renowed Ayurvedic physician Pt. Suresh Chandra Chaturvedi. Ayurveda is rightly called a Vedanga as it constitutes an indispensable part of the Atharvaveda. Ayurveda, the science of life, is inextricably integrated with the composite philosophy of the Vice as. Chaturvediji through his book seeks to remind us of this integrated mode of living that our ancient forefathers followed so fruitfully. - Prithvi (Earth), Jala (Water), Agni (Fire), Vayu (Air), Akasha (Space) - which have a direct bearing on our five senses and five limbs. So constituted, the human body has further complexities in the forms of doshas, dhatus and malas which are also vitally connected with the five elements, for instance, of the three doshas, vata is composed of air Pitta of fire and Kapha of water and earth. One has to establish the right balance among the three in order to enjoy perfect health. This attainment of balance between variables is known as Yoga. At higher levels, Yoga is sought through striking a balance among our Sattwic, Rajasic and Tamasic attributes. One who has mastered the physical as well as mental balance is a really healthy person destined to attain the four goals of life - Dharma, Artha, Kama and Moksha - Righteousness, Wealth, Enjoyment and Salvation. This essence of the Geeta, the discourse of Lord Krishna to Arjuna, forms the foundation of the science of life, which was lost sight of by the common people of our country. Pt. Suresh Chandra Chaturvedi has undertaken a meaningful and commendable venture, which throws light upon many aspects of the Geeta as well as Ayurveda. Geeta Mein Arogya (Hindi Version) .